Please note: All classrooms and wait lists are currently full. 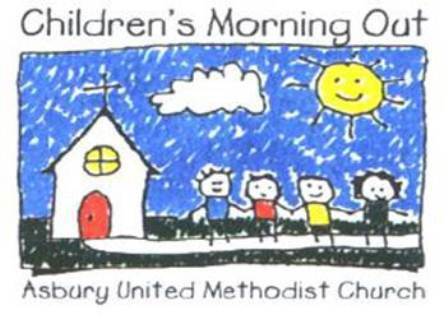 Our Children’s Morning Out (CMO) program for young children incorporates the basic concept of the Christian faith. We emphasize growth in all areas of a child’s life – spiritual, physical, mental, and emotional – as a continuous, interrelated process. To achieve our goals, we believe the teaching methods and techniques used must be based on a proper understanding of child development and the teaching of the Bible. We pledge that our staff will constantly work to foster good attitudes in children by positive example. Under the leadership of qualified staff, our classes will include a balance of activities; creative artwork, music, outdoor play, conversations, story times, dramatic play and group activities. Each child will be encouraged to grow in independence, spiritual and social development, and the development of his or her own unique talents and abilities. Daily outdoor activities, or vigorous indoor activity – dependent on the weather. CMO provides care for children ages 6 months to pre-kindergarten. We offer 6 different classrooms with children divided into appropriate groups. Placement is based on date of birth; classrooms are formed based on child’s age in August, when the school year begins. Once a child is placed in a room, they will not be moved until the beginning of the next school year. CMO Registration is held year round, pending class space. Children are placed in a classroom at time of registration and generally do not change until following school year. Families have the opportunity to choose the days/times they attend. Hourly charges are only for the time your child attends; there is no charge for sick days or family vacations with prior notification. CMO has 6 different classrooms in which children are divided into age appropriate groups. Upon registration, your child will be placed in the room that will best meet his/her needs. Once your child is placed in a classroom, they will generally not move into another room until the beginning of the next school year. Please understand we have specific requirements for several of our classrooms, and we adhere to specific age limitations in our classrooms. While we understand many parents feel their children are ready to move on to the next stage early, please do not ask us to make an exception to our policy. Placing younger children in an older classroom is neither safe nor an advantage when learning age appropriate life skills. We are happy to answer any questions you may have about your child’s classroom placement. A $10.00 late fee will be charged for every 15 minutes your child is picked up after 2:30 pm. An $12.00 “No Show” fee will be charged if you do not report an absence prior to 9:00 am on your child’s scheduled day of attendance. Payments are due by the 18th of each month. Those balances not paid in full by the due date will be assessed a $5.00 billing fee.